Learn the rules of design and the laws of LA for designing, building, and installing a gate. 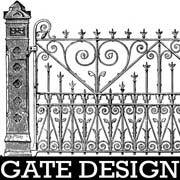 In the Gate Design class, we’ll cover the laws of LA and take you through the steps of designing and building a gate for your passageway. We’ll cover a bunch of rules, team build a gate, then practice installing the gate on all the materials you might encounter: cinder block, brick, metal, and wood. Note: This is a hands-on class, but the focus will not be building your individual gates during this class. Instead, we’ll show you how and talk through your designs so you can learn how to proceed (the building is not the hard part). Afterwards, you can build your own gate during open shop. You can make it simple or complex, modern or medieval. And if the three class sessions aren’t enough, Imerio will be available for private lessons and site-visits to help you figure out how to get your gate got. Instruction and materials fee: $180. Materials for shop project are included. Materials for personal gate is not (allows you to make whatever you want, estimating about $1.50/linear foot of steel tube). Class limit of six. Must have taken Intro MIG prior to the class. Ages 18 or older.